Courage. It's the quality that keeps us going on a day to day basis, and what gives patients, young and old, the strength and determination to overcome obstacles in their rehabilitative journey at the Glenrose Rehabilitation Hospital. The Glenrose Rehabilitation Hospital Foundation exists to enhance patient care through funding for research, education, and the attainment of advanced equipment and technology. Through donations and fundraisers the foundation is able to affect the patient's progress and prognosis. 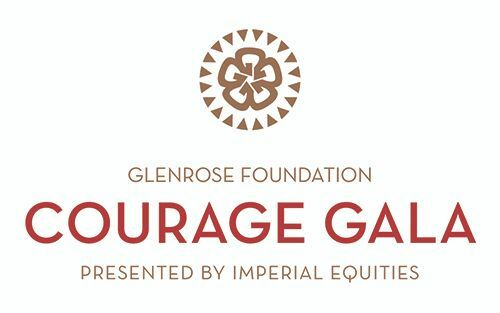 On April 15, 2016, The Glenrose Foundation will be hosting their annual Courage Gala at the Shaw Conference Centre. The theme for this year is "road maps," and part of the evening will feature poetry and journal entries written by patients on their journey through rehabilitation. Whether it is a story of regaining the ability to walk after an injury, recovering speech after a stroke, or healing from addictions, it is sure to be an evening of inspiration and support for patients. I had the opportunity last week to sit down with some members of the Courage Gala Committee for a sneak peak and tasting of the menu being featured at the gala. The Shaw Conference Centre consistently improves their plated meal service, and this menu is one you don't want to miss. 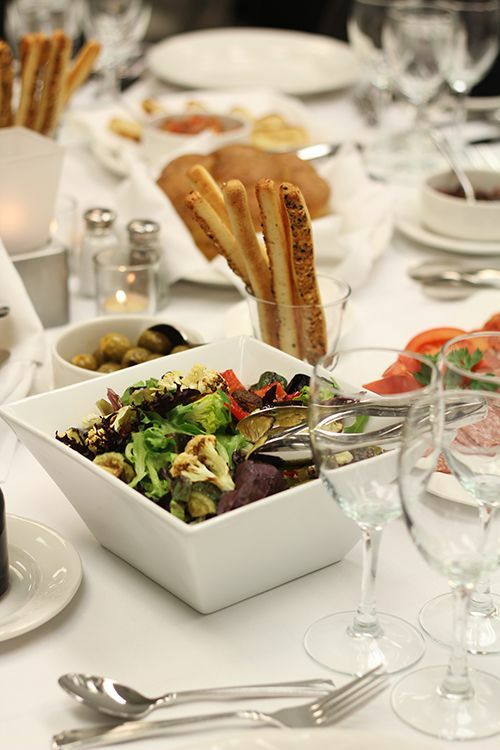 To start off the gala the tables will be pre-set with charcuterie and snacks served family style. 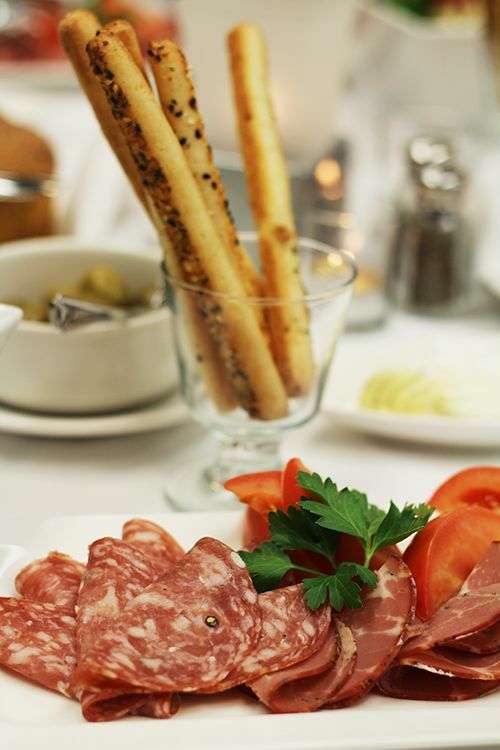 The table will be decorated with grissini, pull-apart basil focaccia, marinated olives, bruschetta, mixed spring salad, and a plate with capicola, genoa salami, and sopressata calabrese. All of the dishes are great starters but surprisingly enough my favourites were the bruschetta and the mixed green salad. The salad featured some perfectly roasted cauliflower, eggplant, zucchini and mushrooms that were full of flavour and balanced the fresh greens very well. 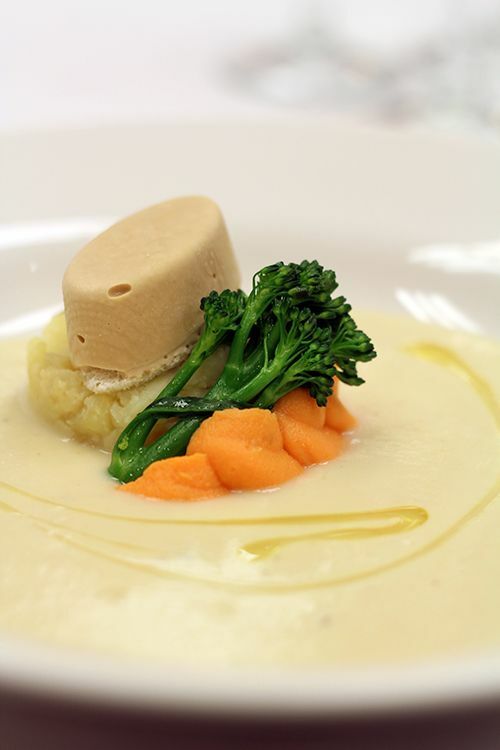 The next course for the evening is one you won't forget: cream of cauliflower soup with lobster bisque ice cream. Yeah, you read that right - savoury ice cream! The cauliflower soup is piping hot and garnished with a bit of mashed potato, cauliflower, and sweet potato. By itself it tastes wonderful, but the contrast with the icy, creamy lobster bisque is something else. You have the option to stir the ice cream into the soup and allow it to melt, but I found a small spoonful combined with the hot soup just a delightful experience. The lobster flavour is quite concentrated, so I probably wouldn't eat the ice cream on its own, but all the components combined really worked well. Our third course (which may not make it onto the menu for the gala) was a bit of a play on deconstructed fish and chips. 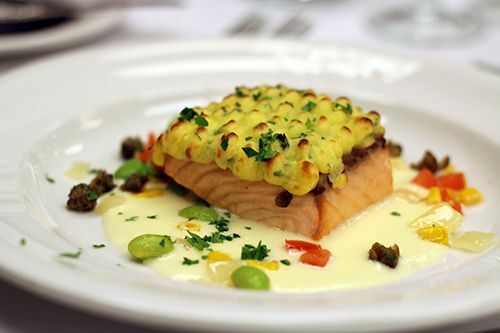 A perfectly cooked potato and chive crusted salmon sat in a warm tartar sauce garnished with roasted capers, tomato, egg, and edamame. The salmon was moist and the tartar sauce didn't overwhelm the natural flavour of the fish. It was a solid dish, but it might just have to be nixed for the phenomenal soup to stay on the menu! The main course at the gala will feature a beautiful seared 9 hour sous vide beef striploin in a wild mushroom sabayon. 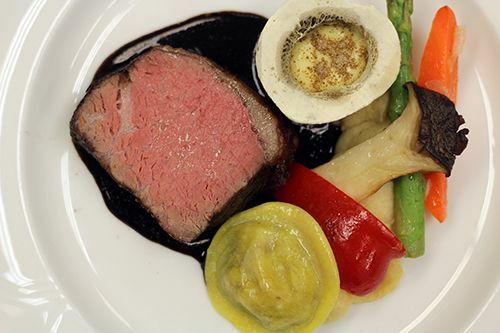 The main protein will be accompanied by oxtail and short rib ravioli, seasonal vegetables, a king oyster mushroom, and a rich bone marrow beurre blanc. The tender striploin is delicious paired with the rich bone marrow beurre blanc. And the ravioli? It was so tasty that everyone at the table voted for two on the dish. Saving the best for last, the gala dinner will end with a stunning chocolate mousse on a shortbread cookie with a quenelle of vanilla bean ice cream. 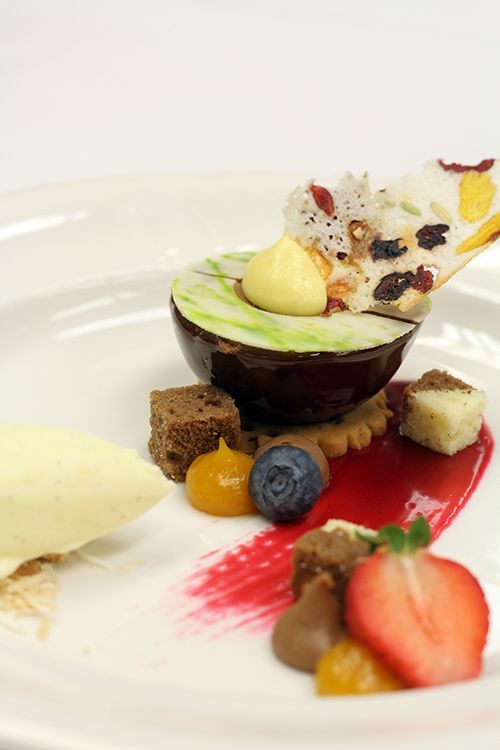 The mousse is garnished with fruit, mango puree, raspberry puree, and cookie pieces. Although rich, this decadent dessert is a wonderful finish to the meal. The 2016 Courage Gala brings a great opportunity for attendees to enjoy a fantastic meal and support a charitable organization that directly impacts patient care. For event and ticket information head on over to the event website and consider joining the Glenrose Hospital Foundation for an evening in celebrating the courage and strength of patients and those who support them in their rehabilitative journey. It's a night you won't want to miss! *Disclosure: I was invited by the Glenrose Rehabilitation Hospital Foundation to attend their gala menu tasting. Views expressed in this post are solely mine. This post is 100% my opinion, and as always, my priority is to you, the reader, to present an unbiased, thorough review.